So excited to share a few photos of the completed COCOCOZY Design House! Today, was so excited that House Beautiful decided to do an exclusive house tour of this remodel project I have been working on for almost 10 months. Last year, I bought the house and started remodeling it in April. Now, here it is, a 1930 classic Spanish Colonial Revival nestled in the hills of Los Angeles in an enclave called View Park. I was about to faint when I saw this as the main feature image on HOUSE BEAUTIFUL!!!!!!!!!! We made the lead story, and I am so honored! The COCOCOZY Design House Reveal! I will, of course, be giving you all detailed tour with all of the specifics over the next few weeks, but here are a few teaser photos of how the project turned out. My style is an eclectic mix of flea market finds, traditional design, some California rustic, and my own accessible chic style. Hi-lo design. Pictured in post are the living room, dining room, kitchen and one of my favorite of the 4 baths in the house. Me on the back stairs with custom COCOCOZY Logo stain glass behind me! Shout out to all of the partners involved to make this Design House a reality! Let me know what you think of the cococozy design house reveal! 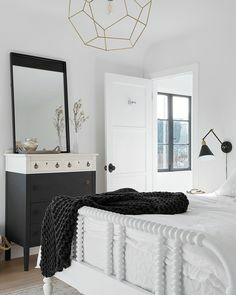 Very beautiful, such a clean but cozy aesthetic. It’s beautiful! When can I move in? That house is fab and you look gorgeous. Great dress.